Pardon The Punctuation...When it comes to OKC the last thing I expected to find was good coffee. All I had was steak and BBQ on the brain. 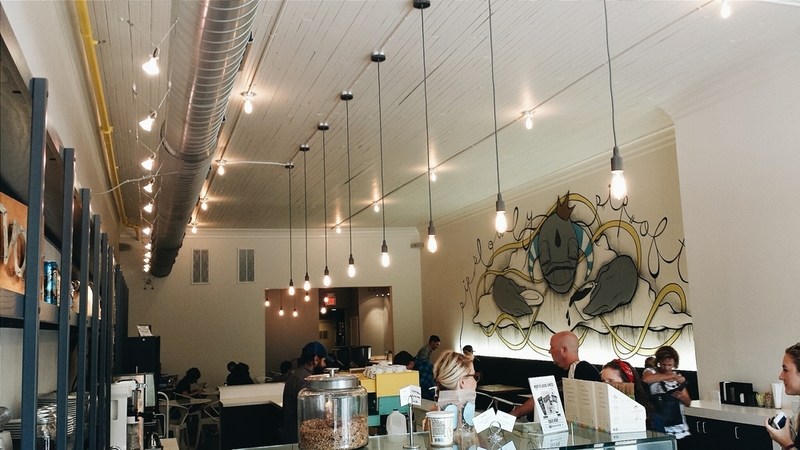 So you can imagine how happy I was when I discovered Café Evoke in Edmond, Oklahoma. Surrounded by mom and pop antique shops and restaurants sits this coffee gem. Serving up featured premium coffee from the likes of Ritual Coffee and Cafe Grumpy...some of the best roasters in the country, the people at Evoke know what's up. Not only is their coffee killer but they've got some solid food items for you to scarf down. My favs were the waffle breakfast sandwich and any of their freshly baked goods. You pretty much can't go wrong there. The staff is attentive and friendly. The seating area is inviting and has a cool mural painted by a local artist. If in OKC and you're a coffee lover...have no fear... Evoke will satisfy your cravings and get you though the day.